Birmingham, AL – Troy Newman, President of Operation Rescue, will join national pro-life leaders in Alabama this week to demand the closing of the Planned Parenthood abortion facility in Birmingham, Alabama, in light of a documented pattern of substandard practices, and its continued defiance of Alabama law and regulations. Despite multiple egregious violations found during a recent failed inspection, the Alabama Department of Public Health has been slow to enforce Alabama laws when it comes to the Planned Parenthood facility. The pro-life groups hope to change that this week. In addition to Newman of Operation Rescue, other participating pro-life leaders include Catherine Glen Foster, CEO of Americans United for Life; Rev. Patrick J. Mahoney, Director of the Christian Defense Coalition; and Fr. Terry Gensemer, director of CEC For Life, who organized the week’s events. State and local leaders from Alabama are also expected to participate. The groups will conduct joint press conferences in Birmingham on Tuesday and Montgomery on Wednesday, along with a series of planned radio interviews, including one on Priority Talk Radio with Greg Davis Monday, October 16, 2017, at 3 p.m. CDT. For more information about Planned Parenthood Birmingham, including quotes from Newman and other national leaders, please see the CEC for Life press release, which is reprinted below. BIRMINGHAM, AL, Oct. 13, 2017 — On Tuesday, October 17th, at 9:30 AM, Catherine Glenn Foster, President & CEO of the nation’s premier pro-life legal group, Americans United for Life (AUL), will hold a press conference directly in front of Planned Parenthood Birmingham. She will be joined by national pro-life groups Charismatic Episcopal Church For Life, Operation Rescue (OR), and Christian Defense Coalition (CDC), as well as the pro-life community of Alabama. As a national leader in state law, AUL provided model legislation for many of Alabama’s regulations regarding abortion facilities. The Alabama state legislature used AUL’s model legislation to pass laws protecting Alabama women and their unborn children from dangerous, substandard abortion facilities. Sadly, these laws have not been consistently enforced. This press conference will expose this lack of enforcement and offer concrete solutions to protect Alabama women and children. It will also launch the campaign Birmingham Babies Deserve Better, which is dedicated to exposing the substandard practices of Planned Parenthood Birmingham and its continued defiance of Alabama law and regulations. National and local leaders will call for specific regulatory agencies to take action to hold Planned Parenthood accountable, including the revocation of this deficient facility’s license. This is not the first time CEC for Life has helped launch such a campaign. Alabama’s abortion businesses have a well-documented history of disregarding lives and state laws, and CEC For Life has worked with many national organizations in the past, including Operation Rescue and Christian Defense Coalition, to expose the substandard and illegal activities of these abortion businesses to seemingly apathetic state agencies. 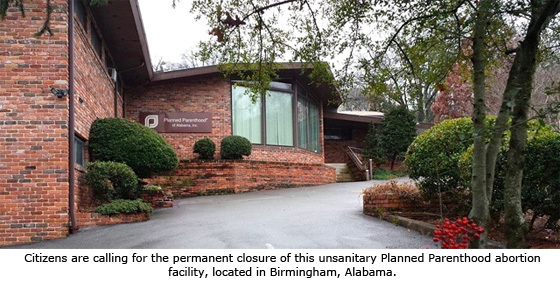 In 2013, a nearly two-year public awareness campaign resulted in the final shutdown of the nefarious New Woman All Women facility in Birmingham, an abortion business that once yielded 76 pages of deficiencies, and even opened illegally after losing their license from the state. In 2015, CEC For Life, along with The Restoration Project and leaders like Dr. Alveda King, worked together again to expose and close down Samuel Lett’s illegal and unlicensed abortion operation in the historic city of Selma. The press conference will take place Tuesday, Oct. 17th, at 9:30 a.m., directly in front of Planned Parenthood (1211 27th Pl S). Later that day, national and local leaders will hold a second press conference on the steps of ADPH in Montgomery, calling on ADPH to enforce Alabama law and regulations, and hold Planned Parenthood accountable for its deficiencies. Director of CDC Rev. Pat Mahoney, based out of D.C., says, “We are coming to Birmingham and Montgomery to ensure the women and children of Alabama are protected from the dangerous and unsafe practices of Planned Parenthood. It is the solemn responsibility of state and governmental agencies to ensure the citizens of their state are protected from harm and danger.